Nearly a half-century into being a feminist and legal pioneer, something funny happened to Supreme Court Justice Ruth Bader Ginsburg: the octogenarian won the internet. Across America, people who weren’t even born when Ginsburg made her name are tattooing themselves with her face, setting her famously searing dissents to music, and making viral videos in tribute. In a class of its own, and much to Ginsburg’s own amusement, is the Notorious RBG Tumblr, which juxtaposes the diminutive but fierce Jewish grandmother with the 350-pound rapper featuring original artwork submitted from around the world. 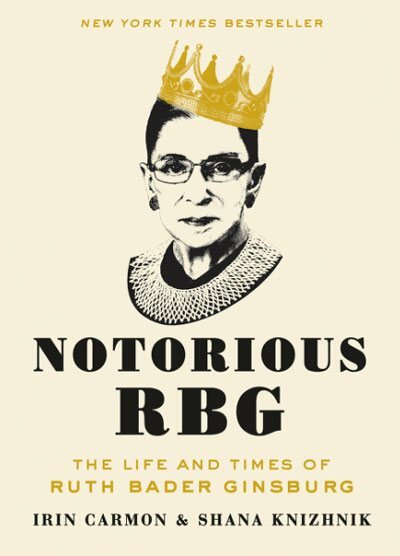 Notorious RBG: The Life and Times of Ruth Bader Ginsburg offers a visually rich, intimate, unprecedented look at the Justice and how she changed the world. From Ginsburg’s refusal to let the slammed doors of sexism stop her to her innovative legal work, from her before-its-time feminist marriage to her perch on the nation’s highest court—with the fierce dissents to match—get to know RBG as never before. As the country struggles with the unfinished business of gender equality and civil rights, Ginsburg stands as a testament to how far we can come with a little chutzpah.